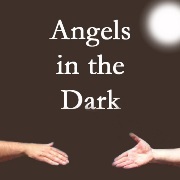 ANGELS IN THE DARK – (DRAMA) Roger Benezoscee is like the worst boss you’ve ever had. What could possibly force this obnoxious, egotistical old megalomaniac to change his ways? Nothing short of a Damascene conversion? Following a revolutionary uprising in her country, “Battle Cries” tells the story of Amina, who flees the chaos of her home town, leaving her mother and brother behind in the increasingly volatile city. The two women’s accounts of their different experiences are interspersed with extracts from the Mu’allaqa of ‘Antara – a poem embroidered on a cloth of gold and publically displayed in Mecca in the 7th century. Battle Cries explores the themes of war, love and separation which are common to both the poets of 7th century Arabia and the more recent experience of the populations in the Middle East and North Africa. A passionate writer of radio drama, Jane has lived and studied extensively in the Middle East. 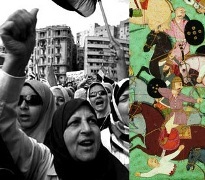 The Arab Spring of 2011 inspired her to write a script, which would combine the traditional tribal poetry of pre-Islamic Arabia, with a female perspective of the uprising. New England. 1898. The Prescott Family is Boston. In that bygone golden age, Patriarch Charles presides over both his shipping line and family with a sure and strong hand, while wife Jocelyn is feeling her authority usurped by her powerfully minded mother-in-law, Augusta. Their children, Marietta, Aurora and Barton find themselves trying to make their way in a constantly changing world - filled with social upheaval and technological advancements. The Prescott's house staff goes about their duties under the supervision of the taciturn butler, Williams. 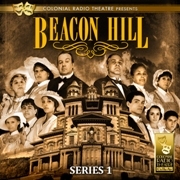 Effortlessly integrating historical events into its narrative (including the second running of the American Marathon – later re-named the Boston Marathon), and filled with intrigue, warmth, and drama writ large, the Colonial Radio Theatre invites you into the Prescott household for an evocative, unforgettable depiction of Boston life as lived by those who set the pace. Criminal lawyer and all-time #1 mystery author Erle Stanley Gardner wrote close to 150 novels that have sold 300 million copies worldwide. 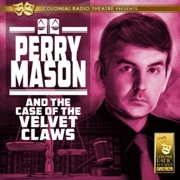 His most popular books starred the incomparable attorney-sleuth Perry Mason. Starring Jerry Robbins and The Colonial Radio Players. Thanks to a bungled robbery at a fancy hotel, the already-married Eva Griffin has been caught in the company of a prominent congressman. To protect the politico, Eva's ready to pay the editor of a sleazy tabloid his hush money. But Perry Mason has other plans. He tracks down the phantom fat cat who secretly runs the blackmailing tabloid -only to discover a shocking scoop. By the time Mason's comely client finally comes clean, her husband has taken a bullet in the heart. Now Perry Mason has two choices: represent the cunning widow in her wrangle for the dead man's money - or take the rap for murder.